24 page Tabloid newspaper signed by Finlay Cowan. First part of the Convergence graphic novel. Includes exclusive interviews about the art and music. 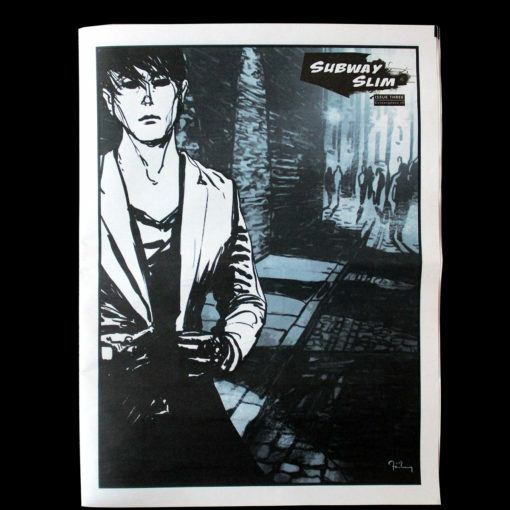 Subway Slim wanders the streets of London observing the lives of countless disintegrating twenty-somethings. He sees the same story being told over and over by people unknown to each other, but linked by the parallel lines of their lives. Even the city itself is a harsh and unforgiving mistress who takes all and gives nothing in return. Convergence, crossing paths, connecting, disconnecting and connecting again. 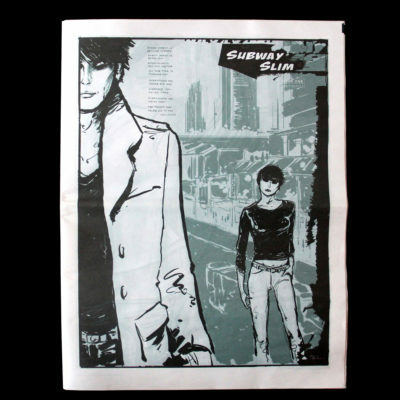 A series of transrealist graphic novels by renowned designer Finlay Cowan. Content: Black and White, Duotone Covers, Duotone centrespread. Posted folded in a cellophane wrapper within a heavy duty card envelope.